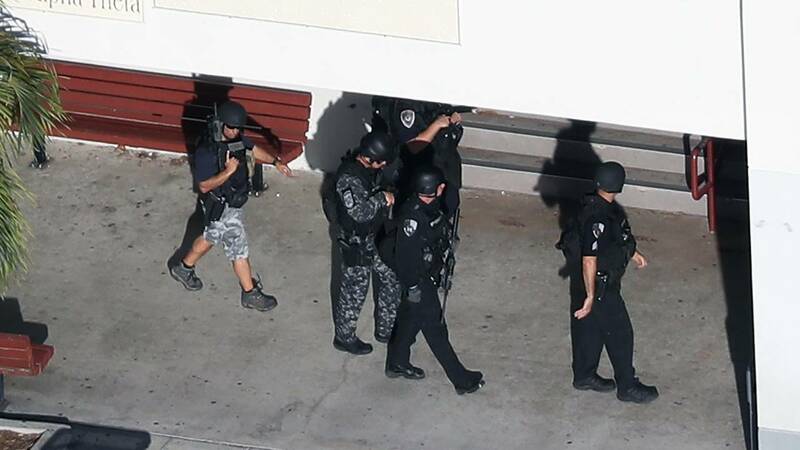 Law enforcement personel work the scene at the Marjory Stoneman Douglas High School after a shooting at the school that killed 17 people on February 14, 2018 in Parkland, Florida. (CNN) - As more details emerge about the Florida high school massacre that left 17 people dead, some of the first officers who rushed to the scene are sharing their accounts of the moment they arrived. Coral Springs Police Department officers detailed their experiences Friday after reports emerged that Marjory Stoneman Douglas High's armed resource officer, Broward County Sheriff's Deputy Scot Peterson, never entered the building as confessed shooter Nikolas Cruz was killing people. Officer Chris Crawford of Coral Springs said he was on patrol at the mall nearby when he heard reports of the shooting on February 14. He jumped into his car and sped toward Marjory Stoneman Douglas High at 100 mph, lights and sirens on, he said at a news conference. When he arrived, he grabbed his rifle and raced toward Building 12, the site of most of the carnage. As he got closer, he found other officers tending to injured students and joined them, applying gauze to students' wounds to stop the bleeding, he said. "We are all issued combat gauze -- which is basically a piece of gauze with a clotting agent inside of it that you stuff inside the wounds," he said. After paramedics arrived, the former Marine rushed into the building, where he was joined by others from his department and deputies from the Broward County Sheriff's Office, he said. The building was riddled with bullet holes, with spent shell casings scattered all over. Instead of smoke alarms and screaming, there was silence. Victims with gunshot wounds lay in the hallways. Students and teachers were still holed up in classrooms and storage rooms, too terrified to leave, he said. In some of the classes, students and teachers had called 911. But they were too afraid to speak for fear of drawing the shooter's attention. Dispatchers on the other end listened to their breathing and other signs of life. "You just have to be quiet, that's OK. As long as I can hear you breathing," Kathy Liriano of the Coral Springs Police and Fire Communications said she told the callers. Inside building 12, Crawford started knocking on doors. "The first two classes were [relieved at the officer's arrival]," he said. "The third class ... I knocked on the door and told them 'I'm Coral Springs Police.' They said they were not going to open the door. I had to negotiate with them ... they made me slide my ID under the door. I could hear more and more desks get pushed up [against] the door," he said. He said if he had his phone at the time, he'd have asked one of the students to call him on FaceTime, which allows iPhone users to make video calls. "I slid my ID under the door and they started asking me questions like what my ID number was ... stuff that was on our IDs," he said. Crawford said he eventually persuaded the students to open the door. The memories of that day haunt him, and says he wishes he could have done more. "It was awful -- it's as bad as you can imagine, times 10," he said. "Every time I turned around, there was another officer with blood [of victims] all over them. It was horrendous. ... I have a 2-year-old. I don't want to send him to school," he continued. Crawford and other officers got about 70 students in one room and told them to call their parents and let them know they were safe. Then he stood guard outside their door as he waited for SWAT members, he said. Coral Springs Police Sgt. Jeff Heinrich's wife and his son were at the school when the shooting started. His wife works there and his son is a student. Heinrich was off duty, but he raced to the school, where he helped care for wounded students. His wife and son made it out unharmed after evacuating during the fire alarm. "By the grace of God, they found each other. And they were able to shelter in place," he said, breaking down in tears. "It was surreal," Heinrich said. "You never hope it would happen and it did." The officers said at the time they thought the shooter was still at the school, which is three miles from their police department. Coral Springs officers and Broward County Sheriff's deputies have been at odds over what happened and who responded first. When Coral Springs police officers arrived at the school, they were surprised to find that the school resource officer and three sheriff's deputies had not entered the building, sources tell CNN. The sources cautioned that surveillance tapes are under review and official accounts could ultimately differ from recollections of officers on the scene. The Broward County Sheriff's Office said it is investigating reports that the three additional deputies didn't attempt to enter the building as the shooting was going on. Peterson, the school's resource officer, resigned following his suspension Thursday. "I was disgusted. I was just demoralized with the performance of former deputy (Scot) Peterson," Israel said Sunday on CNN's "State of the Union." Israel said the actions of the three sheriff's deputies are under investigation.